Are the Apparitions of Medjugorje Real? This article presents the history of six young healthy adults experiencing an apparition on a daily basis over a prolonged period. The medical tests suggest that there is objective and subjective or nonobjective visionary experience. There is partial and variable disconnection from the outside world at the time of apparitional experience, and sensations travel in a normal manner to the brain of the Medjugorje seers, but the findings of evoked auditory potential tests and screening tests show that the cerebral cortex does not perceive the transmission of the auditory and visual neuronal stimuli received from the immediate environment. Electro-oculographic recording confirms that their eyes are converging at the same point. There are both normal and altered physiological parameters. There is a cluster of synchronisms suggesting objectivity. Complementary psychological and parapsychological observations are presented. There is no evidence to suggest the probability of autohypnosis. The collective percipience, stronger motivation on the part of the apparition, quasiphysical features of the apparition, integration of the apprearer to the natural environment, utmost loyalty and obedience of the percipients to the agent, and controlled “psychokinetic-like” manifestations point toward a true apparition at Medjugorje. The voice phenomenon observed at the time of the Medjugorje apparitional experience is reported in other sites of Marian apparition and not in any other religious or paranormal phenomenon. Reportedly, Our Lady first appeared in Medjugorje, a small village in the heart of the western region of the former Yugoslavia (Bosnia), on June 24, 1981. It is a collective vision, involving six visionaries: Ivan, Ivanka, Jakov, Marija, Mirjana, and Vicka. That afternoon, Ivanka and Mirjana had gone for a walk, and on their way home they saw a figure bathed in light, floating above the ground, which identified herself as the Queen of Peace. The apparition lasted approximately 30 minutes. From that day, Mary has been appearing to the seers, giving them messages for the whole world. The visions are said to continue until the visionaries are given 10 special messages each; Mirjana, Ivanka, and Jakov have already received 10 special messages and no longer have daily apparitions. During the last 18 years many authors have contributed to the Medjugorje literature (Connell, 1990; Craig, 1988; Kraljevic, 1984; Laurentin, 1987a, 1987b; Manuel, 1992; O’Carroll, 1986; Parsons, 1989; Pervan, 1985; Roberts, 1992; Rooney, 1984; Rupcic, 1991; Sivric, 1986). Daily apparitions at Medjugorje usually take place in the late evening. At the time of the apparition, visionaries used to gather in a particular place. They sat down on little stools along with a priest and other witnesses. An anxious expression of expectancy is obvious on their faces. They recite the rosary in a very thoughtful manner. Suddenly the young people stand and line up facing one of the walls. All of them gaze upward at the same time, without ever looking at each other. There is no verbal or nonverbal communication between the visionaries. They appear to stare intently at something outside the room and beyond the reading distance. They keep their hands joined together in prayer and some of them move their lips. At a certain point, all of them withdraw collectively from the place they were standing. Their faces become more relaxed. Then they go toward a table and write down quickly in a notebook the messages, which were given to them during the vision. Afterward, they leave the room each going about his or her own business. Nowadays, they assemble together only on special occasions but have private apparitions at their own homes. According to the percipients, the apparition stands out in objective space and is three-dimensional. All the visionaries see the apparition alike. She appears no more than 19 years of age. She appears real and solid. The apparition is just as clear and vivid in matters of detail such as color and texture of skin and clothing as a material person. She has dark hair and blue eyes. She wears a gray dress with a white veil down to her feet and a crown of 12 stars. The apparition was viewed at different distances. The brightness of the figure is irrespective of light; it does not fade in dark light and does not become brighter if there is more light. The apparition obscures the background, and during the apparitional occurrences, everything in front of the visionaries disappears. A few medical scientists before the detailed tests of the French and Italian medical teams conducted individual tests on the visionaries. Dr. Stopar Ludvick, a neuropsychiatrist from Belgrade who is the founder of Theistic para-psychology, studied Medjugorje events, staying there incognito for several weeks. He only directed me to visit Medjugorje in December 1985, and I have visited this place more than 20 times. Professor Joyeux from Montpellier and his team conducted various medical tests from March 24, 1984 to December 30, 1984, as per the desire of the French Marian theologist Rene Laurentin (Laurentin & Joyeux, 1987). They studied all visionaries except Mirjana, whose apparitional experiences had ceased in 1982. They have reported both normal and altered physiological parameters. During the apparitional experience, the EEG recordings of Marija and Ivan show the presence of beta rhythm to begin with, which is replaced by alpha waves, the rhythm of relaxation and mediation. The ocular and visual functions of the seers within the scope of the apparitional experience were studied by Dr. Jacques Philipott, an ophthalmologist from Montpellier, with a series of tests conducted several times before, during, and after the apparition. Dr. Philipott found that before, during, and after the apparitional experience Ivan, Marija, and Ivanka’s direct and conscious photomotor reflexes were normal and symmetric. The corneal reflex, although present before and after the event, was absent during the apparitional experience, when shining a blinding light did not cause their eyes to blink. Dr. Philipott’s tests demonstrated that Ivanka and Marija’s eyelid movements during the apparitional experience were two times slower than before and after. In fact, Ivanka blinked 10 times during the vision, against her normal 22, and Marija 7 times instead of 12. A decidedly less frequent rate than normal state. To determine whether a material object could obstruct the seer’s visual perception, the medical team placed a sheet of opaque cardboard before their eyes. Ivanka and Marija’s celestial vision was in no way interrupted by the transparent intrusion. Ivan and Marija were subjected to an important test to study their eye movements using electro-oculogram readings. The seers reacted to the vision simultaneously to within 0.1 to 0.4 seconds; their eye movements ceased simultaneously, almost to the second, as the apparitional experience commenced. The only evident muscular movements during the vision were those related to gesticulation and conversing with the apparition; their eyes were motionless. After the apparition, however, eye and muscular movements resumed at exactly the same time. Electro-oculographic recording demonstrated that their eyes converged at the same point. Papillary contraction was found to be normal and unchanged before, during, and after the apparitional experience, and frequent eye movements were quite manifest before and after the apparition. During the apparitional experience, blinking reflex was absent but was normal before and after. Dott Santini, the Italian investigator, used an estesiometer to confirm the absence of corneal reflex; the hundred-watt bulb used during his tests failed to make the seers blink. Dr. F. Rouquerol, whose report concluded that the auditory pathways included normal conductivity before the apparitional experience, monitored Ivan’s hearing. Records show that conductivity remained normal during the apparition; yet, when a 90-decibel sound was introduced into Ivan’s right ear, after the apparitional occurrence Ivan declared to have heard nothing. Prior to the apparitional episode, he was startled when 70 decibels were applied. The medical team with an impedanceometer carefully studied the visionaries uncommon voice activity, distinguished by unmistakable axiomatic articulation without phonation. Their tests revealed a number of exciting findings. The instrument’s needle showed extensive movements of larynx muscles while the seers recited the rosary before the apparitions, but as soon as the apparitional episode began and the voices became inaudible, the larynx stopped moving and the needle was still; during the conversation with the apparition, the seers’ lips moved without phonation. As the voices returned, in the middle of the apparition, to recite the “Our Father,” which, according to the visionaries, had been started by the Virgin, the needle moved again. Articulation without phonation occurred once more during the final phase of the apparitional experience, as the visionaries voice was replaced by silence, although their lips were moving. As the seers began to speak, at the end of the apparition, the movements of the larynx resumed, showing that the vocal extinction experienced at the beginning of the apparitional experience is linked to the absence of movement of the larynx, and although the lips were moving quite normally, the act of exhaling did not vibrate the vocal cords. The findings of the French team were confirmed in September 1985 by a series of important tests performed by Italian doctors. The sensitivity of the visionaries to pain was tested with an algometer, and while prior to the apparitional experience their reaction to pain was normal (between 0.3 to 0.4 seconds), during the apparition they did not perceive any pain. The medical teams conclude that there is partial and variable disconnection from the outside world at the time of the apparitional experience. Sensations travel in a normal manner to the brain of the Medjugorje seers, but the findings of evoked auditory potential tests and screening tests show that the cerebral cortex does not perceive the transmission of the auditory and visual neuronal stimuli received from the surrounding environment. This indicates a disconnection located somewhere in the cortex, and it can be thought of as functional dualism, comparable to a motorcar being functionally divided into two by pressing the clutch. Medical tests with Medjugorje visionaries at the time of the apparitional occurrence point toward an objective and subjective or nonobjective visionary experience. As pointed out by Rene Laurentin, there are two pieces of evidence supporting subjective vision. The screening test does not impair the vision; therefore, the normal visual pathways are not used, and the evoked auditory potential tests proves that during the apparitional experience the auditory pathways remain normal but are not used. Rene Laurentin presents three pieces of evidence indicating objectivity: The convergence of their gaze as confirmed by video recording made face-on to the visionaries during apparitional experiences is an obvious feature observed by all the witnesses. The simultaneity of the cessation of eyeball movements as established by electro-oculography is another evidence indicating objectivity. The simultaneous raising of their eyes and hands as the apparition disappears upwards is the third one. Rene Laurentin, who led the medical teams, concludes if the vision is objective, and the above points would seem to indicate that these modalities of the vision are not those of ordinary perception, itself objective, but not measurable by our tests. The above medical observation can further be clarified by the ESP-PK theory of apparition (Rull & Beloft, 1980). According to this theory, the psychokinetic powers of the appearer and the ESP powers of the seer result in the actual sighting of the apparition, who is present at the physical site. The ESP powers of the seer and the psychokinetic abilities of the appearer are involved in the apparitional experience of the percipient. The appearer is capable of psychically interacting with t he physical reality, resulting in his images perceived by the seer through normal sensory channel. At the same time, the ESP powers of the percipient are activated and the self-image of the appearer, in turn, is perceivable through ESP. Thus, there are dual modes of perception. There is both objective and subjective perception. There is a mutual involvement in the apparitional perception without any mental contribution from the percipient. There is paranormal perception as well as physical perception. To use an analogy from the physical world of sensory experiences, we are able to see an object because of light reflecting on the object and also because of the sensory ability of vision. In case of the objective vision of the apparition, the reflecting on the object is analogous to the psychokinetic powers of the apparition. The objective vision is also possible because of the visual senses. The subjective vision is independent of the physical senses. In the case of Marian’s apparitional experience, the objective vision is due to the “Psychokinetic-like” powers of the apparition and the physical visual senses of the visionaries. I believe that the apparition to facilitate the subjective vision probably enhances ESP powers of the visionaries. Similarly, the voice extinction phenomenon may also be due to “psychokinetic-like” powers of the apparition. The Marian apparitional experience is the fruit of the mutual cooperation of the appearer and the percipients. It is interesting to note how the medical findings tally with the ESP-PK theory of the apparition. I am not conjecturing that the ESP-PK theory explains the whole Marian apparitional experience. It supplements and illuminates the medical findings. Contrary to popular belief, it is reported now in the scientific literature of parapsychology that one does not have to go through a trance state of complete sensory deprivation to experience an apparition. Thoughts and images can be projected on to the seer in mild sensory deprivation. The preceding medical studies have shown that the Medjugorje visionaries are only partially cut off from the sensory world. A noteworthy feature of many of the Marian apparitions is the selective inaudibility of the voices of the visionaries while they communicate to the apparition. This phenomenon has been well investigated in the current apparitional occurrences at Medjugorje. The voices of the witnesses present at the physical site of Marian apparition do not become inaudible, which makes it a selective inaudibility. The voices of the Marian visionaries are not continuously inaudible, but become periodically audible like in Medjugorje; the voices of part of their prayer with the apparition can be heard. In that way also, it is a selective inaudibility. The fact that the voices of all people present at the apparitional site do not vanish rules out the possibility of an unknown geophysical force causing the disappearance of the voices of the percipients. So the selective inaudibility makes it clear that the voice phenomenon is outside the control of the visionaries. More simply, it is like pressing the sound button on a remote TV control. On closer scrutiny, some form of clashing sound can be heard at times when the visionaries converse to the apparition in the silent manner. Milona Von Habsburg (Girard, Girard, & Bubalo, 1988) who had stayed at Medjugorje for several years and witnessed the apparitional experiences more than a hundred times, supports this observation, which has been further confirmed by amplifying the sounds of the apparitional event in the laboratory. It only means that the visionaries are attempting to produce the sounds but their voices are masked. According to the report, in the early stages of apparitions at Medjugorje, verbal communication has taken place up to three quarters of an hour, but the voices of the visionaries vanish in private conversations (Bubalo, 1987). The current apparitions last only for a short time. During verbal communication, we have an auditory control of our voices, which in turn affects the speech movements including the movements of lips (Greene, 1980). This is one of the reasons why the lips movement of deaf and dumb people are different from normally speaking persons while the former people attempt speech movements. Even though the voices of Medjugorje visionaries are inaudible during their verbal communication with the apparition, their lips movements appear to be as if they have auditory control of their voices. The visionaries themselves have admitted to hearing their own voices of verbal communication as normal during the apparitional experience and are surprised that others cannot hear them. This observation itself rules out manipulation and psychogenic aphonia, if at all a skeptic of the apparitional experiences proposes them as distant possibilities. This selective inaudibility of the voices of the visionaries was observed in Lourdes (France, 1856), Fatima (Portugal 1917), Beauraing (Belgium 1932), and Banneux (Belgium 1933) (Sharkey & Debergh, 1973; Ashton, 1958; Trinity, 1984). This phenomenon is not at all reported in any other paranormal or religious experiences and characteristic of Marian apparition. The voice phenomenon had never been highlighted in the Marian apparitional literature, and the visionaries were not under any pressure to communicate in a silent manner. So the allegation that the voice phenomenon is artificial does not hold water. Dr. Lucia Carpello from Mostar noticed that during the apparitional experience a number of synchronistic behaviors occurred, and Rene Laurentin elaborated on them. This type of behavior is defined by simultaneous occurrences of certain objective actions having an identical frequency of speed of movement. A good example is given by a flock of birds flying in V shape. Having studied the Medjugorje apparitions in detail, Rene Laurentin (1984) reported seven occurrences of synchronism during the apparitional experiences suggesting objectivity—three voluntary and others probably involuntary. The disappearance of the visionaries’ voices is worthy of particular notice (Laurentin & Rupcic, 1984). As the apparitional experience commences, the visionaries kneel down together, usually simultaneously, although it was noticed that reaction times differ; the quickest seer to react is usually Ivanka. In the beginning this particular synchronism, which may be defined as a voluntary behavioral pattern, received great attention. The voices disappear simultaneously and return simultaneously when the visionaries say “who are in Heaven.” To those who asked why the first two words of the “Our Father” had been omitted, the visionaries replied, “Our Lady says Our Father, and we follow on.” The voices return practically at the same time, depending on the reaction time of the seers, and when they finish reciting the Our Father and the Glory Be, the voices disappear once more. As the apparition draws to a conclusion, the seers look up simultaneously, and they justify this movement explaining that “the Virgin Mary disappears upwards.” This is also defined as a voluntary activity. They eye movements of a person looking at a real moving object are different from those of a person looking at an imaginary moving object; the visionaries’ eye movements at the end of the apparition correspond to the former, as I had occasion to witness in a person in Medjugorje. At that point, one visionary, or more, utter more or less simultaneously the word “Ode,” which means “she is gone.” This is also a voluntary action. Before the apparition, Ivan and Marija’s eyeballs are mobile, as shown by the electro-oculogram taken simultaneously for both visionaries, yet, this movement ceases at the beginning of the apparitional experience, within 0.2 seconds. The eyes of the visionaries resume simultaneously normal movement, again within 0.2 seconds. The eyes of the visionaries resume simultaneously normal movement, again within 0.2 seconds, at the end of the apparitional experience. Dr. Georgio Sanguinetti from the Institute of Criminology of the University of Milan noticed another synchronicity, which is ‘a fleeting bodily tremor’ at the end of the apparition. 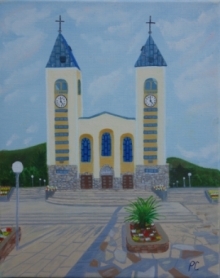 During my 19 visits to Medjugorje, I have observed the visionaries 21 times at the time of the apparitional experience and the ‘fleeting bodily tremor’ caught my attention (Pandarakalam, 1992). I also noticed transient facial movements of perplexity at the end of the apparition. They appeared to me like the perplexed facial movements a person with poor eyesight would make when another person suddenly removed his or her spectacles. Schwartz and Russek (1999b) have suggested that shared spiritual belief can produce systemic interpersonal energy and intention synchronization. As they themselves admit, brought up in the former Yugoslavian communist regime, the visionaries were not deeply spiritual individuals, and so it is unlikely that their visions were initiated by a subtle energy system produced by the collective faith. But it is possible that collective faith has helped the progress of the Medjugorje visions. Four of the synchronisms are probably nonintentional as they appear to be involuntary and may go particularly in favor of objectivity. The eye movement patterns differ in sequence when our eyes are focused on an external object and when we visualize or remember something. The patterns of eye movement are not random. Both the eyeballs converge to a point on the object when we are actually looking at an object in the three-dimensional space. Both the eyeballs move upward and to the right when we just visualize only an object in our mind’s eye, whereas the eyeballs move upward and to the left when we try to remember certain details. They eyes are simply straight when unfocused. The position of the eyes at any given time gives us even an indication as to the part of the brain being accessed. So if the Medjugorje visionaries were only imagining a vision for about 3 minutes, the direction of movements of their eyeball during the claimed apparitional experience would be different from a true perception of an external object. But the eyeballs of the visionaries are converging toward an external point indicating true objectivity and do not follow the eye movement patterns of remembering or visualizing. Pseudohallucinations indicate a special class of psychological phenomenon and are a type of mental image which although clear and vivid lacks the substantiality of perception. Hypnotic hallucinations come under this group. They are seen or are heard in full consciousness and are not located in objective space, but in the subjective space (Kunzendorf & Anees, 1990). They are usually black and white and are less colorful. The movements of the figures are highly restricted and are very much under the voluntary control. The hallucinatory figure is also within the imaginary capabilities of the individual. Self-hypnosis, like hallucination, is a word used against true apparitional experience by the skeptics. None of the Medjugorje seers were aspirant visionaries. Ivan was a reluctant visionary. There is no evidence of any intense concentration before the visionary experience. It is to be remembered that self-hypnotic and true hallucinations have some distant similarities to true apparitional experience, but they are not at all identical experiences. These apparitional experiences are not occurring on the demand of the visionaries or the witnesses. The preapparitional and postapparitional mental state do not tally with the prehypnotic and posthypnotic mental state. Medjugorje visionaries are seeing the apparition in the objective space and the apparition is three-dimensional. In general, people function on three different modalities, viz. Visual, Auditory, and kinesthetic modalities. Everyone is tuned predominantly to one particular modality. Those people who function best on visual modality are the ones capable of pseudohallucinations of visual nature. If the Medjugorje seers are having self-hypnotic visual hallucination for such a prolonged period, one has also got to convince him that all of them are functioning on visual modality. It would have been an extremely strange coincidence that six “visual” people assembled together to have these visionary experiences without an expert selection. These arguments rule out the possibility of pseudohallucinations. As in true apparitional cases, the apparition controls the Medjugorje visionaries and not the opposite way. There have been a few incidences to prove the overruling power of the apparition giving due respect to the free will of the visionaries and the other participants. The visionaries initially refused to cooperate with the medical tests in spite of strong persuasion. So they were requested to consult the apparition, and the visionaries changed their attitude on the instructions of the apparition. They became totally cooperative with the medical team if they were against the tests before this heavenly consultation. Mirjana’s daily apparition ended in December 1982; Ivanka’s daily apparition ceased in May 1985; Jakov’s in September 1998; and other visionaries’ apparitional experiences continue to date. Even though these three visionaries would like to have the daily apparition, overruling the wishes of percipients, the appearer does not manifest to them on a daily basis. This assertiveness is an important feature of a true objective apparitional occurrence. This is a controlling apparition and not a controlled one excluding the probability of auto apparitions. Dr. Stevenson argues that collective apparitions cannot be explained away with the telepathic hypothesis of apparitions (Stevenson, 1982). The Medjugorje apparitions belong to this group of collective apparitions. Recurrent spontaneous psychokinesis (RSPK) involves spontaneous physical effects, inexplicable in terms of known physical energies, that occur repeatedly over a period of time. Dr. Stevenson also believes that visionary experiences accompanied by controlled RSPK indicate a discarnate spirit at the physical site (Stevenson, 1972). The present author shares the same view (Pandarakalam, 1988). There is evidence to believe that Medjugorje apparitions involve manifestation of controlled superior “psychokinetic-like power.” The externally controlled voice phenomenon is an example. The medical observations and synchronisms suggest that the Medjugorje visionaries are responding to an outside power and not to internal stimuli. The dual modes of perception also suggest that there is a nonphysical agent in front of the visionaries. The stronger motivation on the part of the apparition, compared with percipients; collective percipience and quasi-physical features of the apparition; and the limitless loving capacity of the apparition point toward a true apparitional occurrence at Medjugorje. The selective inaudibility of the voices of the Medjugorje visionaries goes in favor of a Marian apparitional experience, as this is a characteristic phenomenon during the terrestrial visitation of the divine Mother. So we are left with the logical option of trusting the visionaries and believing in the reality of Marian apparitions at Medjugorje. After his investigatory studies, Dr. Bartulica (1991) concludes that Medjugorje will remain in the history of either unusual human behavior or authentic apparitions, regardless of the Church’s final verdict. In the years to come, paraphysics, particularly interdimensional physics, might offer complicated interpretations for the apparitional phenomena (Schwartz & Russek, 1999a; Ruth, 1989). Still, one of the alternative explanations of Medjugorje events would be the visitation of the Mother of Christ at the physical site. Scientists should study the unusual perceptions of mentally healthy persons because physicians can use that knowledge to help people in crisis situations (Stevenson, 1995). Even though all religions have demonstrated periods of greater and lesser creativity with episodes of cruelty and terror, fresh infusions of energy and intuition have saved them from ultimate obscurity (Wolman, 2000). Many observers considerer Medjugorje as such a saving grace and an antidote for the afflictions of the present and succeeding generations: a heavenly response to the withdrawing roars of the retreating sea of faith (Pandarakalam, 2000). I am grateful to Dr. Ian Stevenson of Virginia Health Sciences Center for the valuable guidance in my scientific pursuits over the last two decades. Any errors that might still be contained in my rendering are of course not his responsibility. Bubalo, J. (1987). A Thousand Encounters with the Blessed Mary in Medjugorje. Chicago: Friends of Medjugorje. Girard, G., Girard, A., & Bubalo, J. (1988). Mary, Queen of Peace, Stay with Us. Quebec, Canada: St. Francios Nord. O’Carroll, M. (1986). Medjugorje: Facts, Documents, Theology. Dublin, Ireland: Veritas Publications. Rull, Gl, Williams, ?, & Beloft, J. (1980). Research in Parapsychology. London: the Scarecrow Press. Schwartz, G., & Russek, L. (1999b). Registration of Actual and Intended Eye Gaze: Correlation with spiritual beliefs and experiences. Journal of Scientific Exploration. 13, 213-229. Sivric I. (1986). The Hidden Face of Medjugorje. Quebec, Canada: Psilog. Stevenson, I. (1972). Are Poltergeists Dead or Are They Living? Journal of American Society for Psychical Research, 76, 341-358. Stevenson, I. (1995). Six Modern Apparitional Experiences. Journal of Scientific Exploration, 9, 351-366. Trinity, M. de la S. (1984). The Whole Truth of Fatima. Buffalo, NY: Immaculate Heart Publications. Wolman, B.B. (1986). Handbook of Parapsychology. Jefferson, NC: McFarland.